I have a couple more frankens for you today. These are two that I made up about a year ago, but I rarely wore because they were settled at the bottom of the bottle and I couldn't be stuffed shaking them like crazy to fix them up. But now that I got some suspension base, I poured off the clear that was settled at the top and replaced it with some suspension base. Whoo Hoo, they look super awesome in the bottle now. 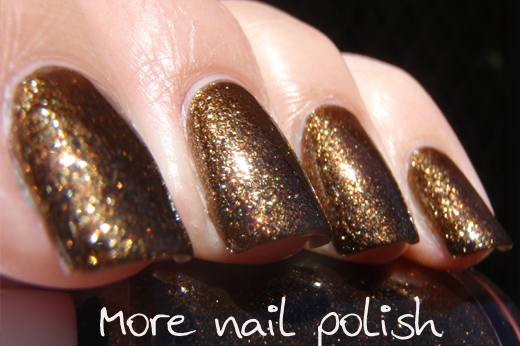 This first polish is made with TKB Copper reflecks, 1/4 a bottle of black and the remainder suspension base. I ended up being a rich and sparkly chocolatey brown. The TKB Reflecks are very fine but have a glass fleck appearance. 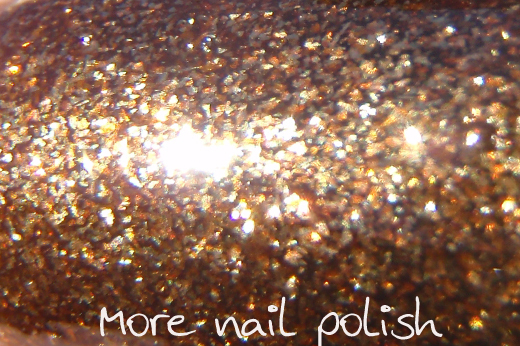 This next polish is a bit of a mash together of a few things, and because I did it a year ago I don't actually remember what went into it. 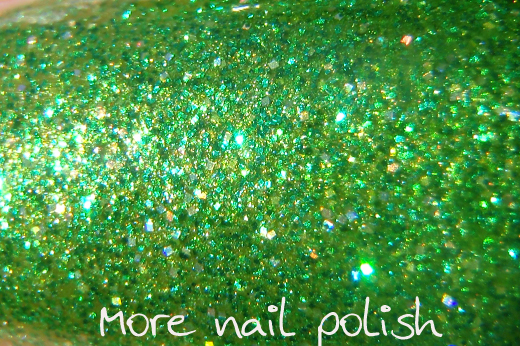 I know there is lots of green glitter, a little gold glitter and some silver holo glitter. 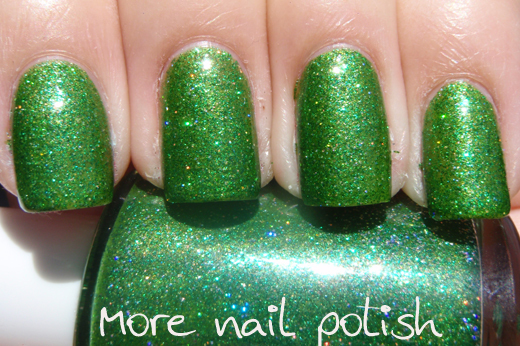 I originally put some green pigment in too, because the clear polish that I poured off was very green. Because I poured out the green base, I added some new green tint, which was Ferric Ferrocyanide and Yellow 10 tint, plus filling the bottle with suspension base. 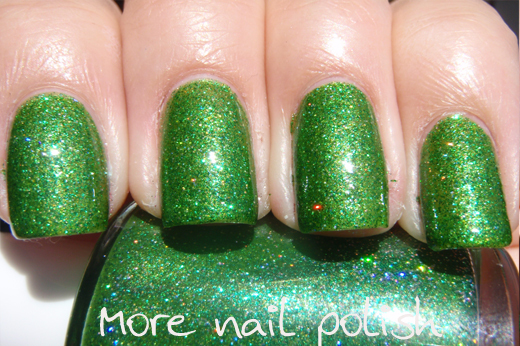 I originally called this polish "lights on the tree" because the holo sparkles looks like Christmas lights on the bright green tree. Just in case you hadn't checked, TKB is now shipping suspension bases internationally!! I think the price that they are shipping it for is really quite good. I was expecting it to be a lot more expensive than that. Canada: $39 = $1.22 / 15ml bottle or 40 cents / 5ml bottle. 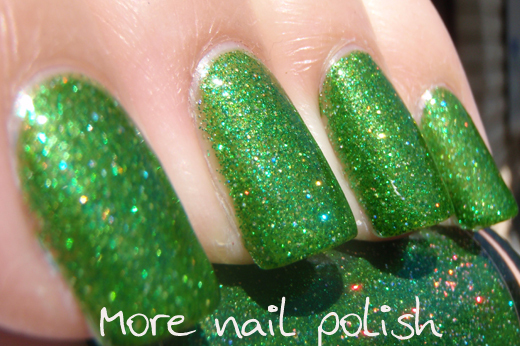 Rest of the world: $69 (but they say ONLY IF your country allows the import of nail polish?!?! they say they will have a list of countries soon) = $2.15 / 15ml bottle or 72 cents / 5ml bottle. Sure it's not cheap, but at least it is available. They are also selling in other various sizes so you can mix bases and tints. It's been a real long time waiting girls (nearly a year) but now almost everyone can get some base. OMG they are both gorgeous! wow I totally love them! Especially the bronze!! !